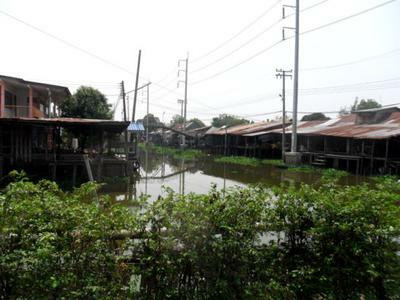 Lat Krabang is a district at the eastern extremities of Bangkok and just north of Suvarnabhumi Airport. 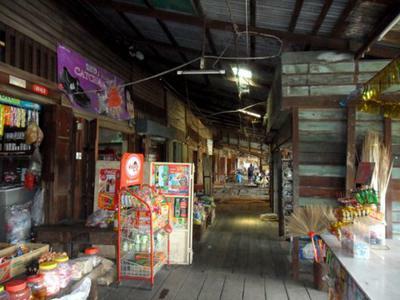 The Luang Phaeng Market in Lat Krabang is located on a rectangular strip of land that protrudes into Chachoengsao province to the north and Samut Prakarn province to the south. 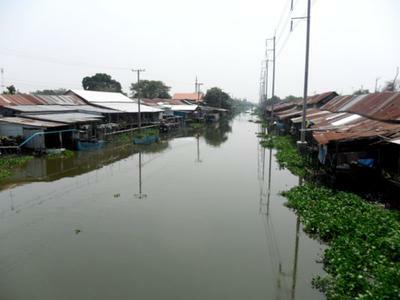 The Luang Phaeng Market is an old market perhaps more than 70 years old that is on the banks of the Prawet Burirom Canal that runs across Lat Krabang district to join the Bang Pakong River in Chachoengsao. Most of the old shops were closed during my visit on a weekday. An old resident explained that the shops only open at the weekends. The old wooden houses look quite dilapidated; many were locked up and didn’t look inhabited. I had to take great care as I walked along the boardwalk as some of the planks looked quite fragile. The people were very friendly and welcomed me to walk through the neighbourhood. I crossed over the footbridge to the northern bank and found the situation somewhat similar except for a new restaurant that has been set-up but not open yet. 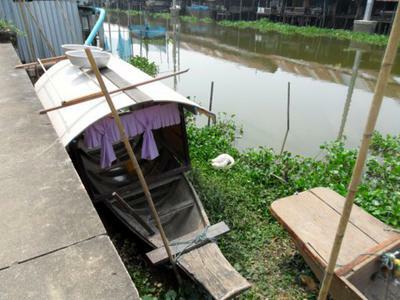 At the end of the passageway along the north bank, a resident pointed out the area where Bangkok met Chachoengsao and Samut Prakarn. It was quiet and peaceful in the neighbourhood during the day. There were mostly older folks and young children around. I should pay another visit to the market on a weekend. Hopefully it will be more active. Join in and write your own page! It's easy to do. How? Simply click here to return to Your favorite Bangkok photographs - share your special moments.